WASHINGTON: US Secretary of State Rex Tillerson has said that the United States has made “some very specific requests” to Pakistan to undermine the Taliban and would discuss those requests with the Pakistani leadership when he arrives in Islamabad on Tuesday (today). Talking to journalists at Bagram Air Field in Afghanistan, Mr Tillerson said the US wanted to work with its “regional partners” to ensure that there were no threats of terrorism in South Asia. This regional effort, he said, was also elaborated in the new US strategy for South Asia that President Donald Trump announced on Aug 21. “So we’re demanding others also deny safe haven to terrorists anywhere in the region. 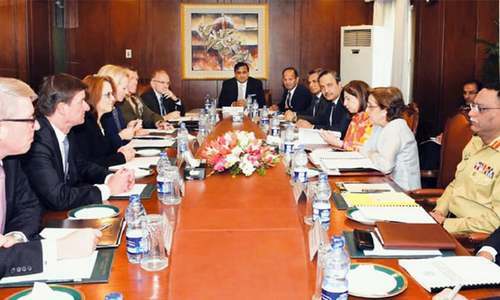 We are working closely with Pakistan in that regard as well,” a transcript released by the State Department in Washington quoted Mr Tillerson as telling the journalists. “And we’ve said in this whole strategy this is a conditions-based approach, and so our relationship with Pakistan will also be conditions-based,” he added. 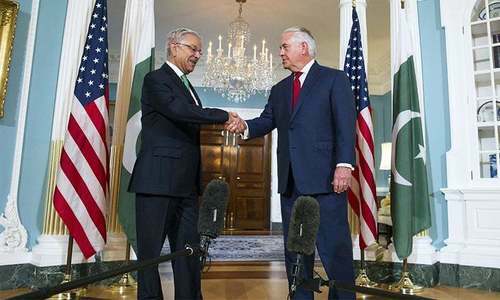 Mr Tillerson said the US relationship with Pakistan was “based upon whether they take action that we feel is necessary to move the process forward of both creating the opportunity for reconciliation and peace in Afghanistan, but also ensuring a stable future Pakistan”. 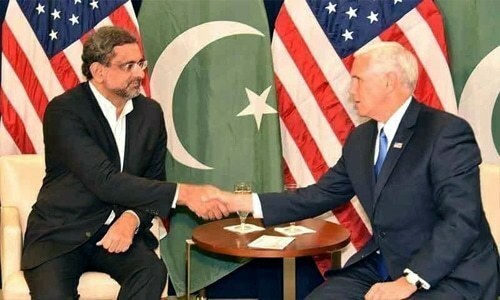 The top US diplomat insisted that those conditions were not to bring peace and stability to Afghanistan but were equally important for Pakistan as well. AP adds: Mr Tillerson said there is a place for moderate elements of the Taliban in Afghanistan’s government as long as they renounce violence and terrorism and commit to stability. Earlier, he met Afghan President Ashraf Ghani, Chief Executive Abdullah Abdullah and other senior officials at the airbase. He said the Taliban must understand that they would never win a military victory and should prepare to negotiate with the government. “Clearly, we have to continue to fight against the Taliban, against others, in order for them to understand they will never win a military victory,” Mr Tillerson said. “There’s a place for them in the government if they are ready to come, renouncing terrorism, renouncing violence and being committed to a stable prosperous Afghanistan,” he said. 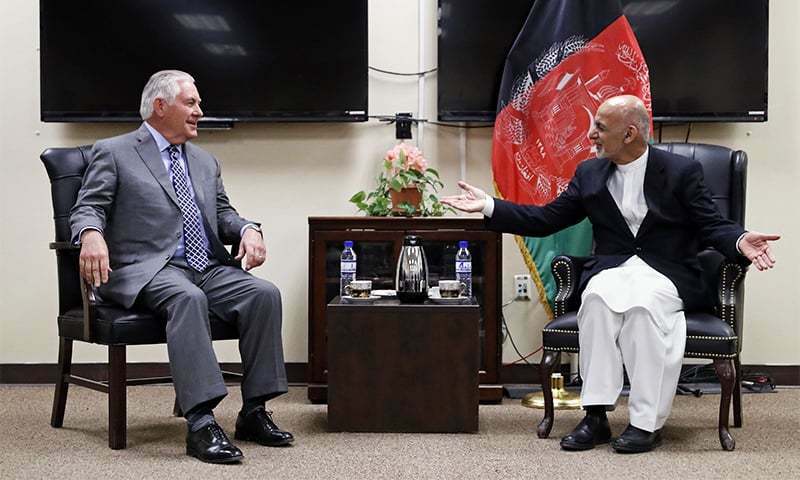 Mr Tillerson outlined to President Ghani and Mr Abdullah the Trump administration’s new South Asia policy, which the views the region through a lens that includes Afghanistan as well as Pakistan and India. How can Pakistan renew its relationship with the United States? Both leaders are serious about bringing peace and stability in Afghanistan. At the end of the day, the United States has to win the hearts and minds of the key players and the general public in the region. Is it a threat or request? It is a request if you accept it. Else a threat! So now they're making request instead of issuing orders to do more. I can say that Pakistan foreign policy is working properly now. No one can win the hearts of the Taliban ... they have none!! Their language is very clear. Their support is only conditional on you doing certain specific things that they want you to do. The ball is now in your court. They have asked you to do certain things. Do it, or face the consequences. This US government obviously means business. No compromise on strategic assets - that much is for sure. Who is financing these terrorists?. has US ever worked on this angle?. No Do More theory should be accepted. Pakistan has done enough, it is time the US acknowledges Pakistan's help and sacrifices in war against terror. All parties should include Kashmir and other outstanding issues in the region. You scratch my back I'll do the same. In this regard he should also make ‘Specific’ requests to Russia, Iran and China too. @Mirza He has! So the recommendations to Pakistan and Pakistan alone! @Al Wazir this is diplomatic threat! @Abdulla Hussain that’s what your PM and FM said and announced,, these statements are after listening to that! US US and US, you creates problem in the region and then asking others to resolve, why you doing all this around the globe??? @Rashid You are in no position to dictate to the US what they can and cannot do. @Chicago keep dreaming... Chicago is far of from Kashmir! Sitting far off and making comments with assumption that you are correct is day dreaming! Please leave us alone. We cant fight your war anymore. If you really want to bring peace in Afg than help Pak 1st to build a proper 2700km long border fence between Pak-Afg to counter the terrorism and to stop the blame game. Something tells me that we are at a post 9/11 stage, where US asked Pakistan to fight its war. Let's see what Pakistan has learnt in these years. The tone has certainly changed in American establishment after Pakistan told them to jog on. How those strong and undiplomatic statements are now turning into "requests". In terms of the lives and business lost, the tarnished international image, the time, money and effort expended to support these groups Pakistan might very well have spent as many billions towards its Afghan strategy as India has supporting development there. For an young, educated nation with aspirations, it is astonishing that the Pakistani media and middle classes have not demanded a change of policy at least half way through all these damage. Now Hakmatyar is promising to take Taliban to internal peace talks in Afghanistan. Let us all, the sane people, hope that peace will prevail in the region, put past behind and get along with what we each have. Asking Pakistan to do more when NATO forces themselves couldn't do much in Afghanistan. Why not Mr Tillerson ask NATO forces to lead by example, ask NATO forces to do more and take back the control of over 60% of Afghanistan, may be we can then think of doing more. For now, our primary focus is the safety and security of Pakistan and we are doing that very well. @Al Wazir yes request Pakistan can not denied. If Karzai recent statement is any indicator of what US is doing in Afghnaistan then all bets are off and there will be no peace in Afghanistan. It is clear from his statement that US presence is the biggest threat to peace in Afghanistan.And why US does not refute Karzai serious allegation while he is under US protection? US again is making Pakistan a scapegoat as recent Taliban murderous suicide bombings show how clueless and helpless actually US and Indians as usual crowing in their master's support.Nothing is going to change no matter how threatening US becomes to Pakistan as the real problem (the insurgency), the center of it is in Afghnaistan. And Taliban as they have done this before will disappear till their next round and high power US diplomats will run like chicken without a head to Kabul, Islamabad, Baghdad blaming others for their failures and one day will airlift their last man from Kabul embassy in helicopters just like they did from US embassy in Saigon in1975!! @Li-N-Ja "Is it a threat or request?" Perhaps the final warning before all hell breaks loose. I think general Bajwa appears to be a good partner for the USA. Kudos to the N-league for at least selecting a moderate modernist, bypassing seniority. @Rashid he would first contact country that needs this message specifically..